Rights-holders are facing a daunting battle against counterfeit goods. In 2012 alone, the EU Customs detained 40 million fakes, worth millions. The new EU Anti-Piracy Regulation, in force as of January 1, 2014, offers an effective first-line defence against fake goods and greater protection than its predecessor, entrusting EU Customs with extended powers to detain infringing products at EU borders. Rights-holders can request EU Customs to proactively stop fake goods at the EU borders via a ‘Community Application for Action’. EU Customs may also detain or suspend the release of in-transit goods on the basis of reasonable indications of infringement of intellectual property rights, and whenever they have suspicions that such goods may be destined for the EU market. As a second-line defence against counterfeit goods, rights-holders are entitled to initiate proceedings for the determination that their intellectual property rights have been infringed and for the destruction of the infringing goods. Counterfeit goods do not enter the EU only in containers but often as mail shipments. A recent judgment delivered by the Court of Justice of the European Union establishes that EU Customs may seize fakes upon their arrival in the EU even when they are purchased on the internet. The main proceedings started when a Danish citizen bought a watch incorporating the trademark Rolex. The purchase was made through a website located in China. The watch was sent by mail from Hong Kong to Denmark, where it was detained by the Danish Customs. After it was established that the watch was a fake, Rolex requested its destruction. The consumer refused to surrender the article for eventual destruction, arguing that the purchase was lawful. Rolex instituted legal action against him before the Danish courts. 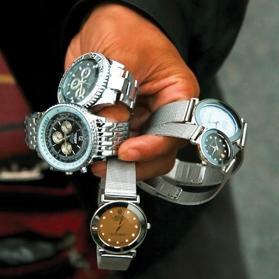 Although it was accepted that the Dane had not acted contrary to the Danish trademark and copyrights laws because he had bought the watch for personal use, the Court of First Instance found in favour of Rolex endorsing the right of Danish Customs authorities to detain and eventually destroy the fake, pursuant to EU law. The Dane appealed and the Court of Appeal requested a preliminary ruling from the Court in Luxembourg. The EU Court ruled in favour of Rolex, confirming that the holder of an intellectual property right is entitled to prohibit a third party from using, without its consent, a sign identical with that trademark when that use is in the course of trade, is in relation to goods or services which are identical with, or similar to, those for which that trademark is registered. Furthermore, under the copyright directive, an exclusive right is conferred on authors to authorise any form of distribution to the public by sale or otherwise of the original or copies of their works. Such distribution to the public is considered proven where a sale has been concluded followed by a dispatch of the item sold. The Luxembourg Court concluded in its judgment that Customs were empowered to detain the watch, even though it was purchased on an online sales website in a non-EU member state that was not specifically aimed at Denmark or at the European Union. Although the watch had not been subject of a prior offer for sale or advertising targeting EU consumers, the fact that the watch was brought into the territory of the EU was sufficient for Customs to act. Therefore, as long as it is proved or it could be presumed that the final destination of the counterfeits is EU territory, the seizure by Customs authorities will be justified. On the other hand, the Court confirmed that the mere fact that a website is accessible from the territory covered by the trademark is not a sufficient basis for concluding that the offers for sale displayed there are targeted at consumers in that territory. It is sufficiently clear now that fake goods bought over the internet that originate from outside the EU can be seized and destroyed by member states’ Customs upon their arrival. Although it remains to be seen how courts in other member states will apply this judgment, the Court of Justice gives useful guidance for rights-holders in their fight against counterfeit goods coming into the EU marketplace, and addresses the increasing online sales of counterfeit goods to consumers in the EU.